Wilson is on familiar territory here - real 'family life with a breaking relationship and three distraught kids. Eldest Em's mission is to try to get her dreamy, unemployed actor Dad to come back home after he drops the Christmas bombshell that he is leaving them for a new, loathsome unemployed actor girlfriend. In fact, storytelling Frankie isn't Em's real Dad at all but she doesn't care. She's his Princess Emerald - and Em has his ring to prove it. Mum struggles to keep the household going and isn't helped at all by live-in Gran, with her constant 'helpful' suggestions about how she should run her life and her relations. The characterisation is excellent in this multi-layered book. 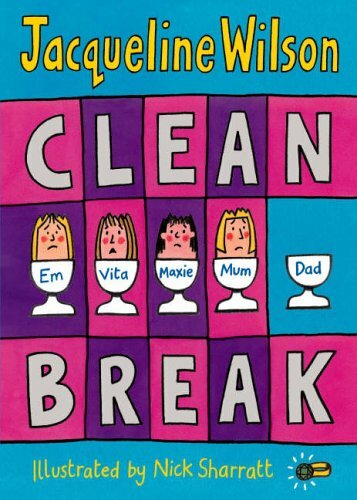 Em desperately wants to keep the family together but frankie's hopeless yet well-meaning attempts to keep seeing the children seem to be doing nothing to help everyone come to terms with the family crisis. Em compensates for Frankie's absence by making up stories all about their favourite glove puppet, a reindeer called 'Dancer'. The prospect of a meeting with famous author Jenna Williams (note the initials and an illustration with more than a passing resemblance to Jacqueline Wilson) would be a dream come true but will her dream of the family reunited actually materialise? Wilson does not traditionally go for the easy happy ending. Sharratt's illustrations are limited to one per chapter, which is a shame. This is another sure-fire winner from this award winning author (including OBE in 2002) whose books are borrowed from the country's libraries more than any other author's.